The Witch’s Familiar: Am I a Good Man? Lies, manipulation, and trickery — “The Witch’s Familiar” burns these candles on the altar of Skaro. The question is who will be sacrificed? Put your hip boots on because the excrement is rising and you’re going to have to wade through the B.S. to decide who has placed the spells and on whom. Hex’s aside, where did Missy get the rope that has Clara hung upside down from a rock and looking a lot like The Hanged Man of the Tarot? (As an aside, it was kind of Missy to use the rope to keep Clara’s skirt from falling to reveal her nether regions.) In the finale of a two-parter that began with “The Magician’s Apprentice,” perhaps the answer is that Missy/Master has the conjuring powers of magic? And while she was at it, she conjured up a relatively substantial stick (on a planet with minimal vegetation and petrified jungles) and a whittling knife, implying that she may get hungry enough to eat her dangling prey. There is no doubt that Michelle Gomez uses her lines to maximum effect and certainly has the ability to bewitch all through her hilarious and paradoxical antics. The Hanged Man is the card of suspension and the unlikely trio (Doctor, Master, and Companion) have definitely found themselves suspended in uncertainty on Skaro. After last week’s episode we were left wondering if Missy and Clara survived extermination. Ok, not really, we knew they survived, but how? Missy enlightens us with narrative, while the producers/directors provide us with a visual of the Doctor’s escape from Androids. Then with a few eye-wink taunts toward Clara and a decision that the two of them have a mission to save the Doctor, they are off to the heart of the Dalek empire. Though not without one final quip from Missy: “Pity then, I was actually quite peckish.” I was literally delighted at the tonality Missy used in saying peckish! Inside the Dalek empire, Davros begins to have what appears to be a heart-to-two-heart talk while the Doctor perseverates on how to find out if Clara has survived. He succeeds in removing Davros from his chair and leaves his half-body writhing on the floor. Free-wheeling out of the infirmary (dare I say arrogantly) in Davros’ chair, the Doctor confronts the Daleks. The Daleks use multiple guns to exterminate him and we are provided a mini-cliff hanger while we switch to Clara and Missy contemplating the depth of the drop to the sewer system, which is the graveyard for decaying Daleks. Chalk another one up for Missy’s evil sarcasm as she bumps Clara from the edge. “Twenty feet,” Missy surmises when Clara hits bottom. I don’t know about you, but if I fell twenty feet, it is likely that I wouldn’t pop up without an ankle twist or a hurt arm, but Clara miraculously jumps to her feet, angry. Maybe the adrenalin means she’s overlooked her pain. Briefly back to the Doctor who has thwarted the extermination and is casually drinking tea. In case anyone questions the Doctor’s abilities, he helps us out with the answer. Because…”I’m the Doctor. Just accept it.” Is this Moffat’s way of covering for inconsistency and plot holes? Back at the infirmary Davros has other plans and Colony Sarff is more than willing to assist. By this point we’re approximately one-third through the episode and I’m wondering at Missy’s motives with regard to Clara. She pulls Clara emotionally back and forth, implying demise then referring to them as a team. Missy, as we know, does nothing without forethought. And her forethought is always a ticking bomb. The bomb of a line that she drops on us in the sewer is an allusion to her past liaison with the Doctor on Gallifrey. She takes a brooch off to direct dark star magic and intimates: “…the Doctor gave it to me when our daughter…” She is startled and we are left with that. Huh? She kills an arriving Dalek using her stick and a really bad Texan accent then encases Clara in the Dalek’s shell. We’re reminded of the classic Who episode, The Daleks, and Ian Chesterton’s climb into an empty Dalek shell (season 1, second story). Dreams and flashbacks and we find the Doctor waking, seated on the only other chair on Skaro. Davros is talking, setting up the Doctor but certainly offering clues. Perhaps the creators of Doctor Who thought we, the audience, would be easily led by the manipulation, but the savvy viewer saw the snake eyes on the cable and knew Colony Sarff was going to cause the Doctor trouble. From Davros’ perspective the Doctor reveals, again, his greatest weakness and he believes that he can play on the compassion that plagues the Doctor’s personality. Meanwhile, Clara is indoctrinated to the mental capacity that will move her Dalek casing. Now that she is firmly seated inside the shell and it is closed, the scene is reminiscent of Oswin Oswald (“Asylum of the Daleks,” series 7, first episode). Oswin was wholly converted to Dalek. Perhaps it was the full conversion that made the difference, but I was still left questioning how Oswin could speak and it would be translated verbatim, but when Clara spoke the words were bastardized by the Dalek casing. When I consider that further, it must be observed that the Dalek wiring was supposed to be picking up Clara’s thoughts and those thoughts would control the casing. How, then, without the actual Dalek physical body inside, could the Dalek casing change Clara’s words? To finish watching the episode that confusion must be put aside or we’d never get through the scene that allows the Doctor to discover Clara in the Dalek without derision. We are treated to further seemingly endearing, though manipulative conversations between the Doctor and Davros. We laugh when the Doctor chooses to save the sunglasses because we are in on the joke, but Davros is not. 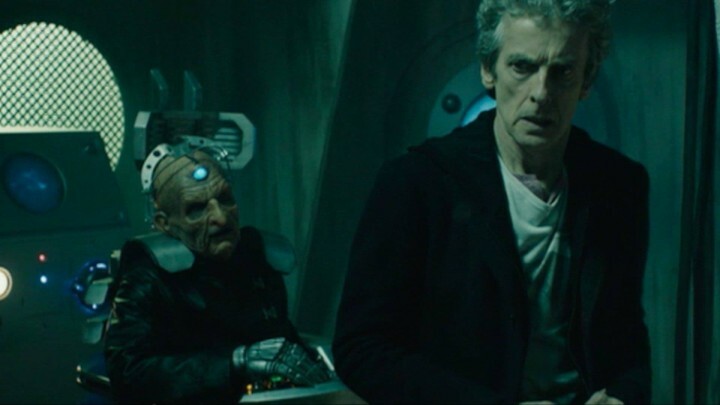 For the first time we see Davros open his own eyes to look at the Doctor. And I don’t know about you, but I let out a loud guffaw when Davros asked if he was a good man. It may be at this point that the Doctor fully realizes Davros’ manipulation and plots the demise of Davros, the Daleks, and the heart of the empire. Calling upon regeneration energy, the doctor grabs the cables, which are Colony Sarff, and his regeneration energy surges into Davros and all the Daleks — all the Daleks and that includes the undead. You’ve got your wading boots on, right? Because, you guessed it, the excrement of decaying Daleks is literally rising through the pipes of the city, causing destruction and eventual demise. Of course the Doctor would not have been stupid enough to allow the Daleks to remain half Time Lord and half Dalek, now would he? It does appear that Missy saves the day when she bursts in to sever the Doctor’s electric connection. Always the paradox, Missy’s “goodness” soon reverts to her typical evil ways when she attempts to get the Doctor to murder Clara. Remember when I said you needed to suspend the question of the Dalek casing mistranslating Clara’s speech? Well, if you have not been able to do that, then the touching ending will be entirely lost. Clara’s emotions eventually cause the Dalek to say the word mercy, which the Doctor surmises has been coded into Dalek genetics. And that word saves Clara from death at the Doctor’s hand. How did the coding of mercy occur? No, this episode isn’t smooth, consistent sailing either. However, it provides some interesting links between characters and some great dialogue with memorable one-liners from Missy, the Doctor, Davros, and Clara, especially as Oswin throw-back. I’ve yet to read discussion regarding the titles of the two-part opener for Series 9. Who is the magician and who is the apprentice? Who is the witch and who is the familiar? Missy does refer to Clara as a poppet, does this imply that Missy is the witch? Would that make the Doctor the magician? Or are the titles simply used by Moffat because we’re approaching the cusp of October and the magical time of year? Finally, in this finale, is Missy the sacrifice on Skaro’s altar? Yes, I already know your answer, but the discussion could be fun. I didn’t trust Davros for a minute, and knew the Doctor would go back and exterminate the hand-mines d: did Missy say “our daughter”? I thought she said her daughter. can’t trust anything she says either way though. how did the snake fellow penetrate the forcefield on Davros’s chair? how did the Doctor get a cup of tea? not much point in worrying about it. Agreed. . .who would trust Davros for a minute? And apparently the Doctor though the same. It may be likely that Missy was just toying with Clara when she alluded to a daughter, but it gives everyone something to talk about if they were paying attention! I would imagine that Davros had his force field either amended or synced with Colony Sarff, who is a legion of minions for Davros. The tea, though, yeah. . .now that is a mystery. . .conveniently dismissed as implausible by the Doctor’s comment “accept it.” *rolling eyes* Not every writer can get away with that, for sure! Agreed! I was thinking that he may have tossed that out there to attempt to draw a comment such as yours from the Doctor. And then I wondered if somehow he knew that the Doctor had asked the same question of himself. . .but how could he? I’m going to go out on a limb and make the assumption that Davros making that comment isn’t coincidence. . .Moffat put it there intentionally to juxtapose the two characters, but how deep does that rabbit hole go?